"Crunchy cabbage slaw with apples, peppers, and carrots." Toss the cabbage, carrots, green bell pepper, red bell pepper, Red Delicious apple, and Golden Delicious apple together in a large bowl. Whisk the apple cider vinegar, sugar, and sea salt together in a small bowl; season with black pepper. Pour the vinegar mixture over the cabbage mixture and gently toss to coat. Cover the bowl with plastic wrap and refrigerate at least 30 minutes. 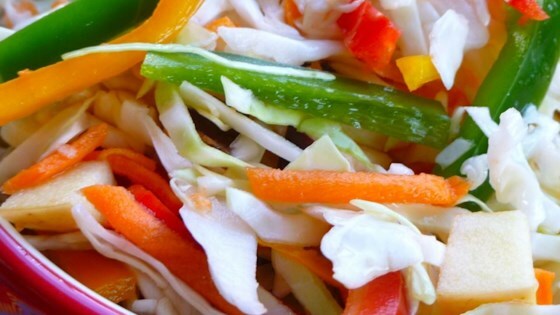 Although this slaw is packed with nutrients it lacked in dressing. I had to double the dressing with a little less sugar. If you want to impress company this colorful slaw will work. healthy and delicious! Will make it again! good but I liked it better when I added a half cup of raisins. Simple, light and crisp. A refreshingly easy way to dress up a salad. Love it.